Happy Manicure Monday everyone! I hope you all had lovely weekends. I went to Max Brenner on Saturday night. If you love dessert, get yourself over there ASAP. I had "The Fantastic I-Scream Bar Fondue" and it was absolutely divine. They give you a vanilla popsicle, which is adorably wrapped in their own ice cream wrapper. 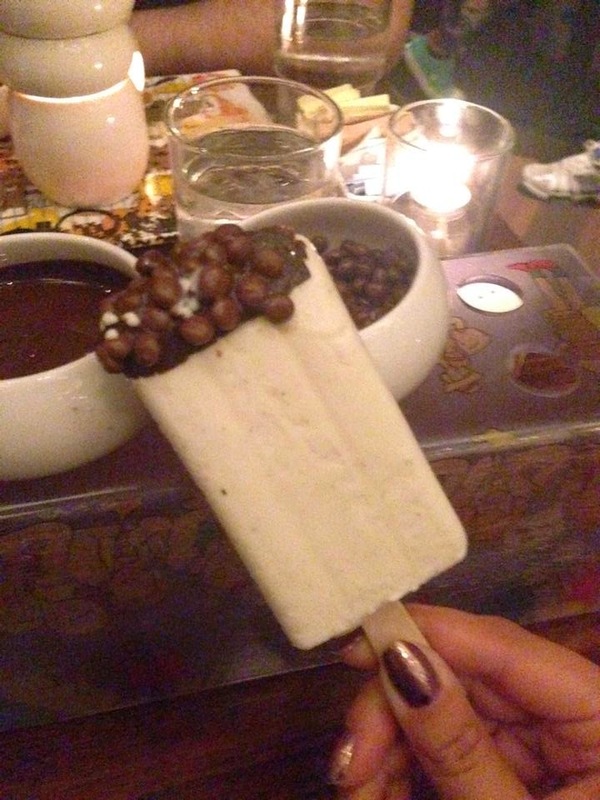 It is served with pure melted chocolate (I requested dark chocolate), candied hazelnut crunchy bits, and Choco-pops. I highly recommend this one in addition to their churros fondue and the O.M.G dark chocolate chunk cookie. I'm literally sitting here salivating just thinking of all these delicious desserts. It was so dark in there, made it hard to get a clear picture of all that goodness! Onto the nails! I decided to try out Julep Tatiana, which I received in my Jewel Heist Mystery Box. 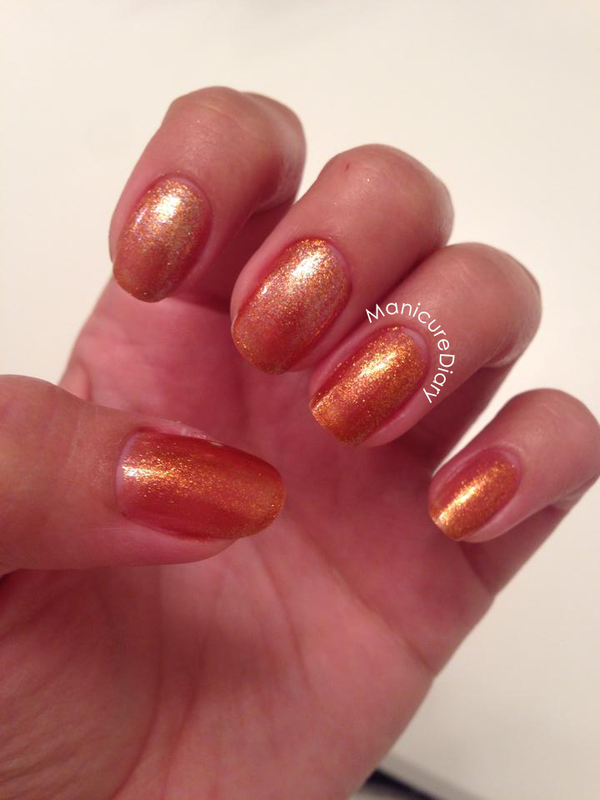 Tatiana is described as a "golden burnt orange micro glitter." 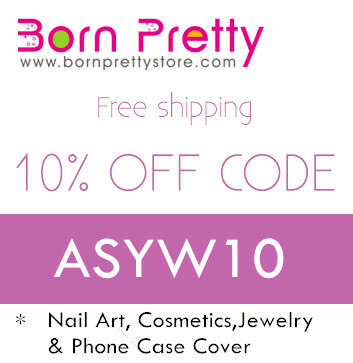 I was surprised by how much I liked it on my skin tone. 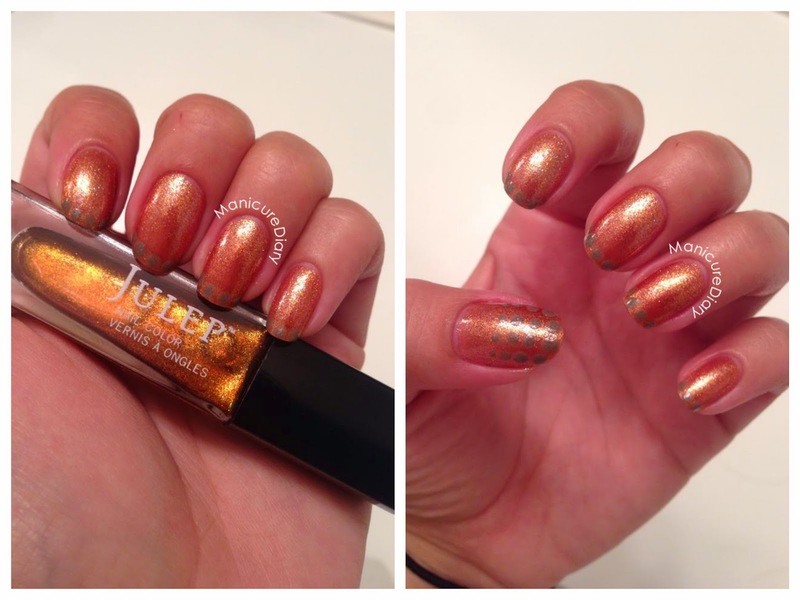 I was looking through the other unworn polishes in my collection and came across Julep Adele, a "golden reflective top coat," and swiped it over Tatiana on two nails. Tatiana alone on my thumb, ring, and pinky fingers. Adele over Tatiana on my index and middle fingers. I ended up topping each nail with Adele and liked the way it lightened up the orange of Tatiana. Both polishes are way more beautiful than I expected them to be! And then for some reason I decided I wanted to do a dot design, but I am really unhappy with how it came out. Do you ever get an idea in your head for a mani and then when you actually paint your nails you hate the way it looks? I should have just left Tatiana and Adele alone. Oh well! Here are the colors I used, from left to right: Julep Tatiana, Julep Adele, Essie Mochachino. *Edit: After wearing this mani for a day I really couldn't stand the dot design so I painted over it with a fun twist on a french manicure. 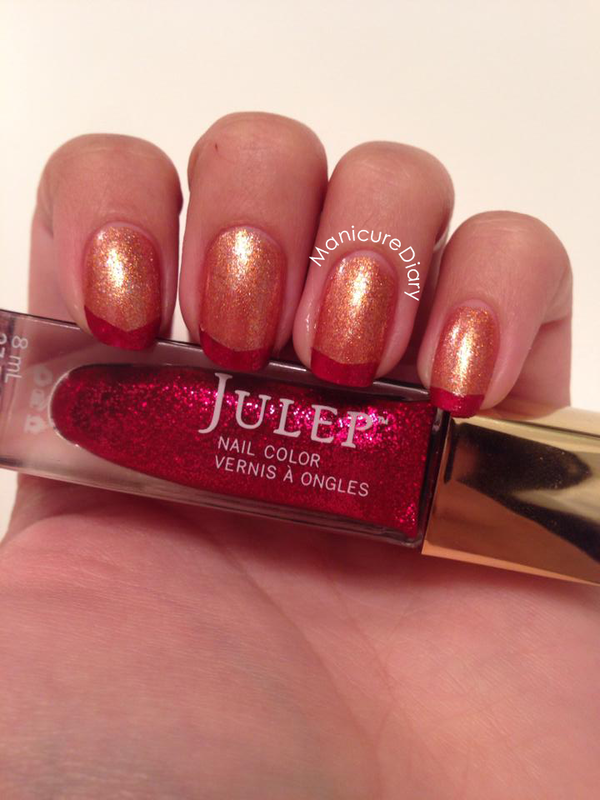 I used Julep Martina, a ruby red multidimensional glitter top coat. It went on smooth and gorgeous in one coat. Reminds me of Iron Man! I like it.